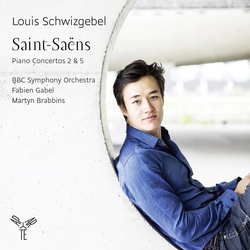 This album dedicated to Camille Saint-Saëns came about as a result of a sensational performance of the Concerto No. 2, performed in 2014 with the BBCSO. Convinced of the value of this, the label Aparté and BBC radio decided to join forces to produce, under the same conditions, the Concerto No. 5 to complete this transcendent programme. Swiss-Chinese pianist Louis Schwizgebel has been described as “a pianist with a profound gift” by the Guardian (August 2013), an “insightful musician” by the New York Times (May 2013) and “already one of the great masters of the piano” by Res Musica (July 2014). At the age of 17 he won the Geneva International Music Competition and, two years later, the Young Concert Artists International Auditions in New York. In 2012 he won second prize at the Leeds International Piano Competition and he is a BBC Radio 3 New Generation Artist 2015/16. Louis records for Aparté and his first solo disc, 'Poems', [AP067] which features works by Ravel, Liszt, Holliger and Schubert was released in 2013 to exceptional critical claim. Germany’s Fono Forum gave the disc four stars and hailed Louis “a genuine virtuoso, a spirited young genius with real depth”.